Sarah, we must be on the same wavelength! These words from Chesterton make my heart and soul happy! His words are so jam-packed with so much goodness and so much challenge it's hard to decide on what to touch on. Strength. Us not being strong enough. 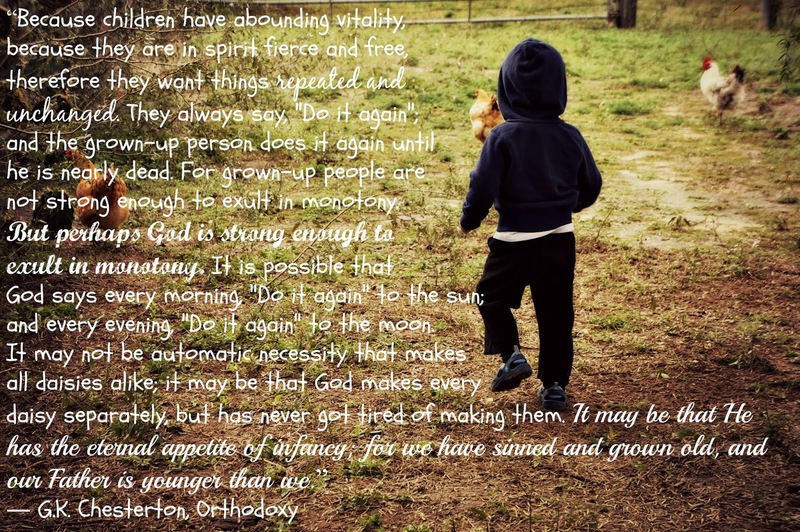 The vitality of little ones. God's strength. The morning, evenings, daisies, beauty and a Father who is younger than we. What I mainly bring away from it all at this moment is hope. There is hope in the child's fierce spirit. There is hope in that my God is strong enough to not only partake in monotony, but to exult in it. Lord knows I try Him! There's a sweet and joyful hope that God our Father is younger than we and has the eternal appetite of infancy. This hope is so very encouraging. This hope makes me feel held, even at my worst. Praying that I be able to joyfully embrace the blessed monotony that is mine. 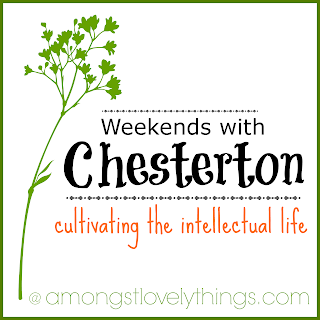 Visit Sarah's for more Weekends with Chesterton.